Here's another review sent to me by the artists. By now, it seems like this feeling would have gotten tired, but here we are! Olde is from the fabled Canadas, across the St. Lawrence Seaway, as is their label, Hypaethral Records. Much like Germans and David Hasselhoff, I love Canada and have a hard time saying no to one them, especially if they speak the dual languages of their home and native land. 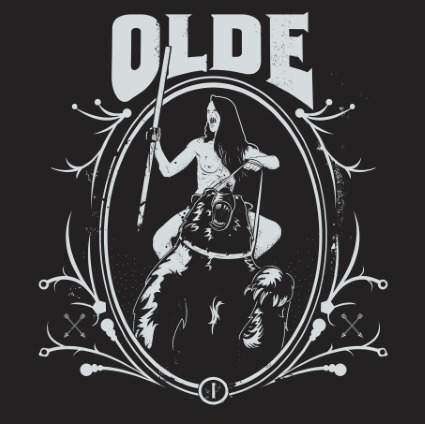 So, Olde is a doom/stoner metal band, but they've taken a new approach to the genre. As we move on with the review, we'll get into what they are and what they are not. Even though this is their debut record, the musicians themselves have been at this for a very long time. Even the story of their genesis is interesting. Guitarist, Greg Dawson chose the members and assembled them one by one without their knowing who else was in the band. Then they met on a driveway. The music sounds like you'd expect doom or stoner metal to sound like. It's thick. Unlike lots of Stoomer Metal, there aren't any very long tunes. Even Sabbath had very long tracks and some with extraordinarily long guitar solos that just really...well...yeah. That isn't what Olde is about. They have a groove and begin it at the beginning and just don't let go of it till the record's done. It's not flashy, overtly technical, or even recorded all that well. Because it's not those things it's a very enjoyable record that fans of Orange Goblin, Clutch, or High On Fire could really get behind. Just don't look for any psychedelic tropes or riffing where they got into a "serious thing."